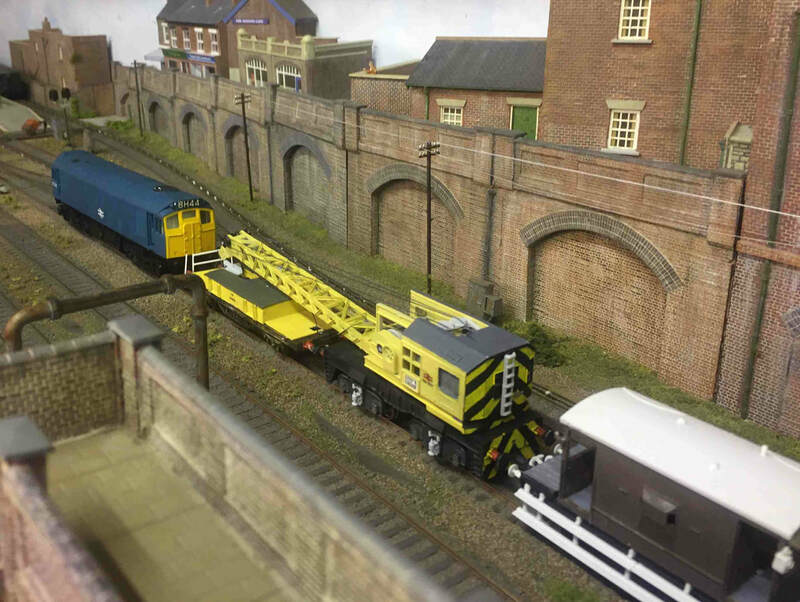 In an attempt to recreate a scene recalled from holidays in Northumberland when younger, I purchased a Dapol Booth Crane kit and a Brake Van kit. 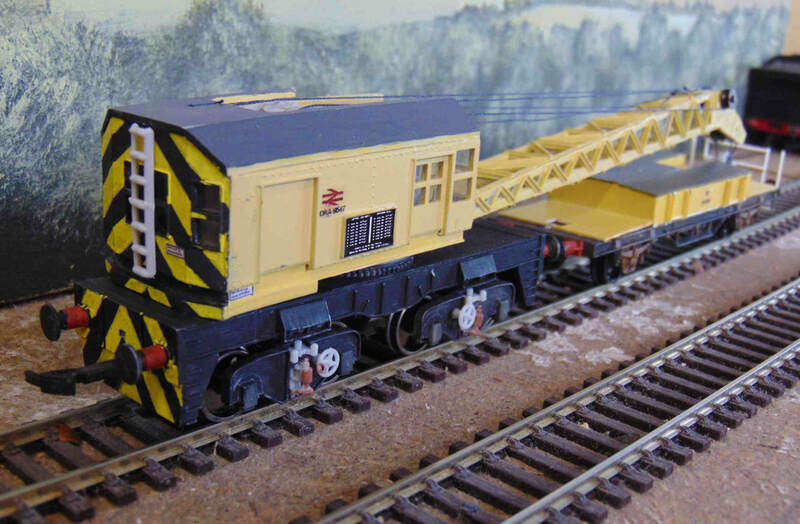 The first problem encountered was the Dublo type couplings on the crane kit; incompatible with any of my locos; and secondly, the huge overhang of the crane jib. The solution to both was to construct a Matchtruck from an old Jouef HO tanker (photo 1). 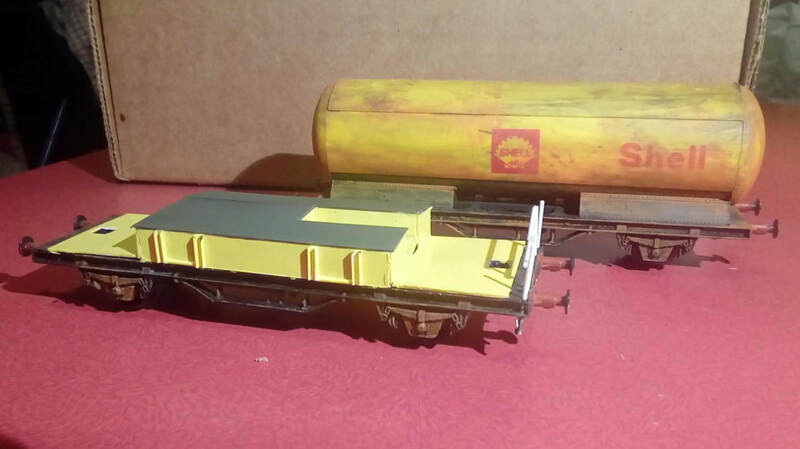 This was stripped of tank, rewheeled with larger diameter wheels and fitted with a Dublo coupling one end (supplied in the brake van kit) and normal Hornby style one the other (photo 2). The brake van was also similarly equipped. A button cell holder was fitted to the bottom to power a red led light fed through to the centre rear lamp via fiber optic cable (photo's 7 & 8). Very pleasing result. 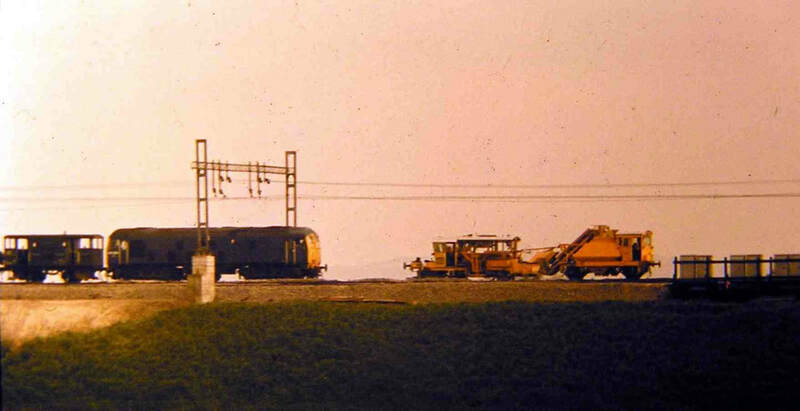 Unfortunately I then looked up the original photo, only to discover it was of a tamper not a crane! 9. Inspiration for building the model. 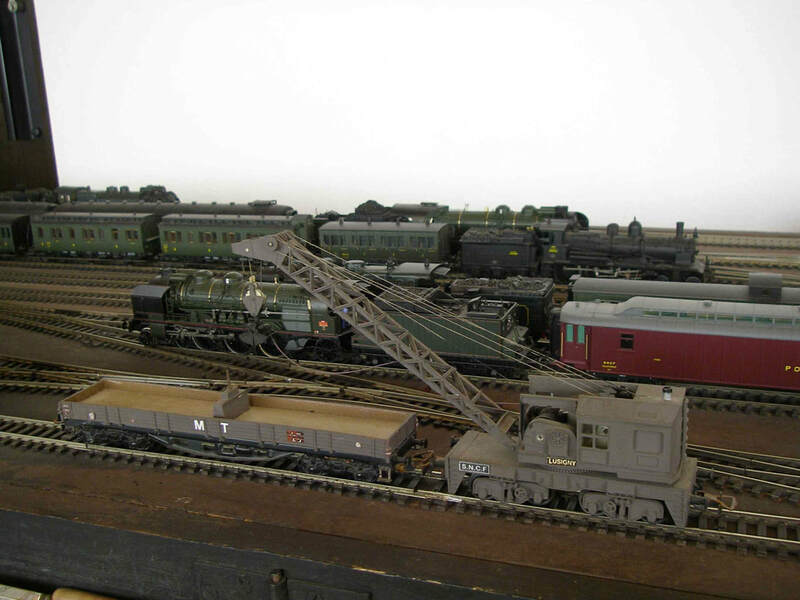 This one has been adapted to H0 scale for my French Layout. 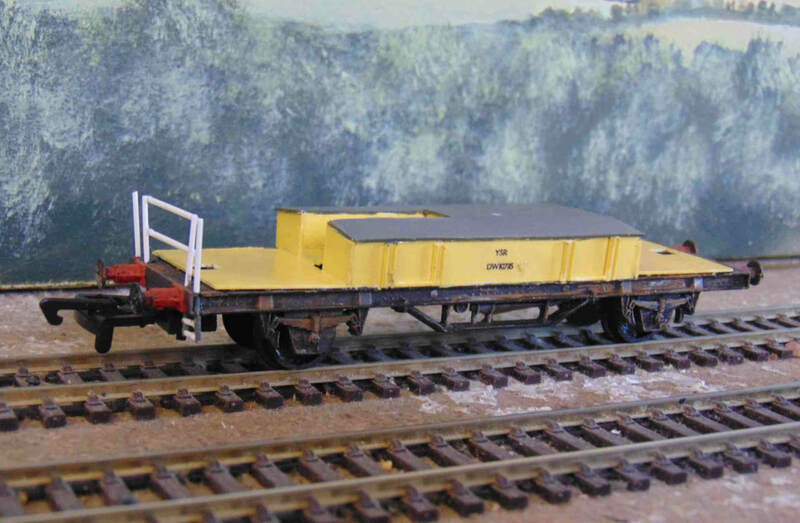 The buffers have been flattened top and bottom to make them like French ones and the bogies are fitted with smaller metal wheels, to lower the buffer line a trifle to H0 level. 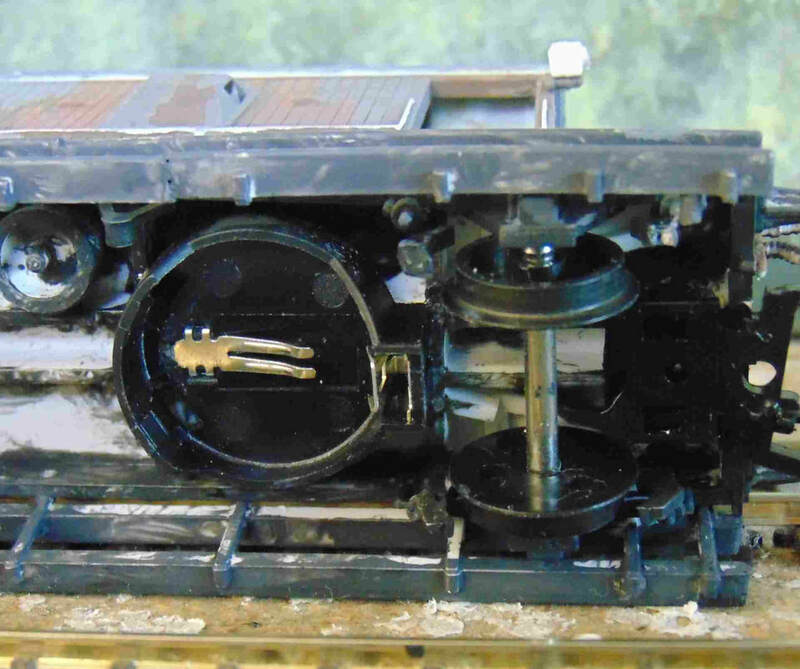 The continental couplings, from goodness knows where, are fitted through slots in the buffer beams and attached to the original coupling mounts under the footplate. 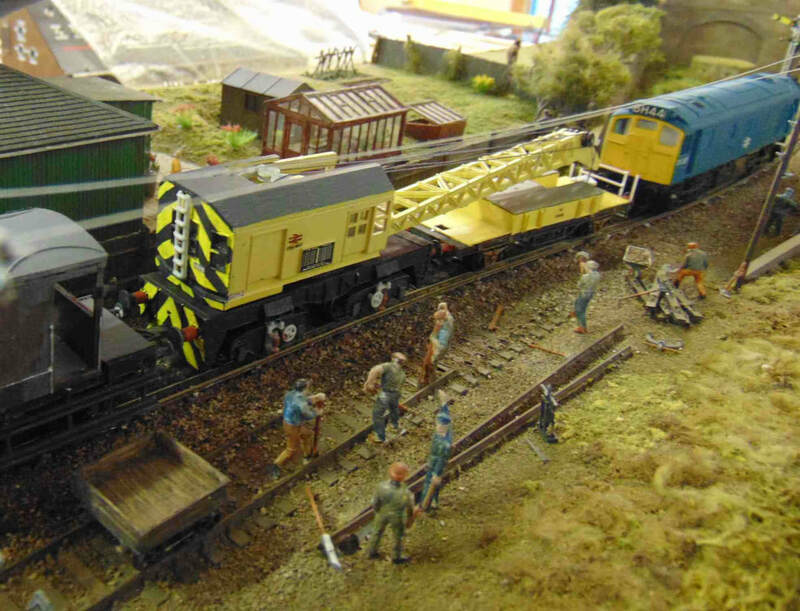 It's supposed to be a coaling crane so has a grab fitted (from a Roco accessory, I think) in place of the hook. To keep the 'cables' taut, the bucket is filled with small ball bearings, with 'coal' sprinkled on top, the whole lot glued in with white resin glue. There's some weight (a lump of solder) in the crane body to stop it tipping over. You'll note it sports a chimney too, to make it a steam crane! 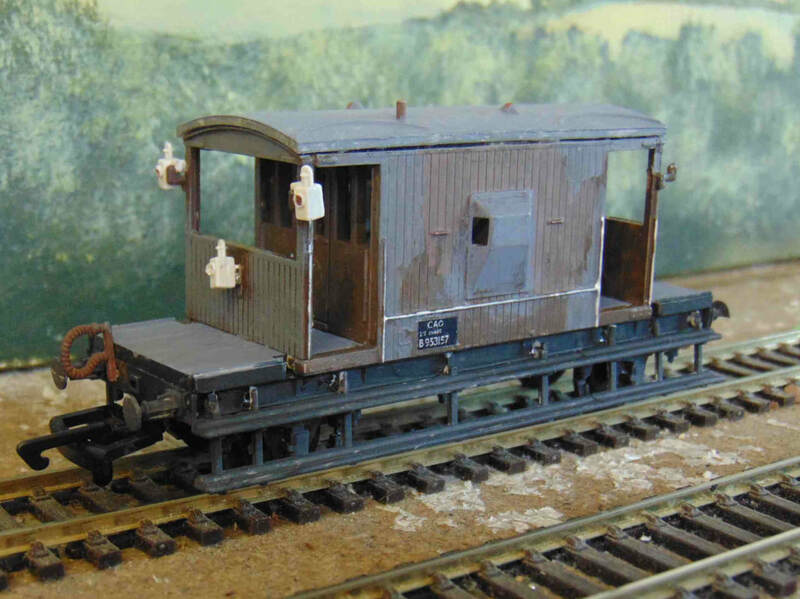 The match truck is an old Märklin wagon with tinplate chassis, re-wheeled because it was originally 3-rail. The ensemble is all painted a nondescript brownish grey. The lettering on the crane was made on my computer, printed onto paper and stuck on, then fixed with a thin coat of matt varnish. The 'M T' on the wagon is Lettraset. I just painted round the other markings. Much to my surprise, when I tried it, it was actually possible to marshal it into a train and run it round the layout.